There was a time when baby clothes were filled with much tradition. I know that I had a few hand me down outfits that were saved specifically for my babies. I loved the look and style of them. Now baby clothes have silly sayings and are more like miniature adult clothes. I miss those special gown and dresses for girls and the sailor rompers for boys. I bet in yesteryear you could find a sailor suit at every holiday and church event. Feltman Brothers has been around since 1916, this is a family owned business that has run for three generations and has some of the most beautiful baby clothes I have seen. 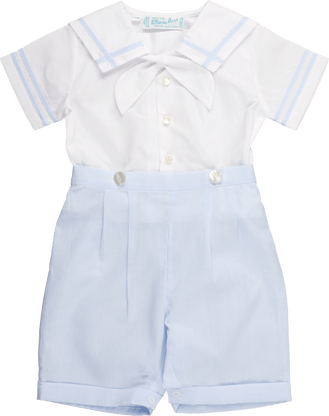 From special occasion dresses for baby girls to beautiful rompers for boys they have captured the feeling and style of heirloom baby clothes. The sweater that I received from them is so gorgeous, and made with such care you can tell just by looking at it. Tiny buttons and embroidered flowers were the perfect accents to this beautiful soft pink sweater! The boy clothes are adorable and it is so hard to find church clothes, christening outfits and the like for boys. Feltman Brothers has so many choices for your little boy. From sweaters and day gowns, coming home outfits and even rompers they have anything you would need and want for that special boy in your life. You will have no problem finding an heirloom outfit for you to save for their little boy. Feltman Brothers will be having their 100 year anniversary in 2016 and I have to say I cannot name too many businesses that have been around for 100 years. If you are looking for the perfect shower gift or the best looking baby clothes you can find, you definitely want to look at their website for the collections they have available. I know that I have a special sweater now to keep for many years to come. To keep in touch with Feltman Brothers you can follow them on Facebook, Twitter, Pinterest, and Instagram, make sure you check out their website as well.